A magnificent Italian design with remarkable functionality. Able to turn a full 360 degrees around its outer axis and tilt 45 degrees both sideways and backwards, the Fratello offers endless possibilities to utilize your exterior. 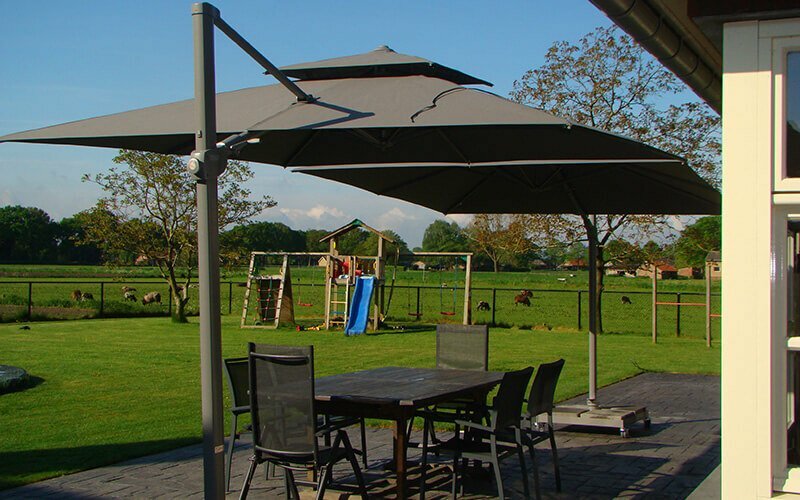 With the Fratello, you’ll cover a large area in virtually every position, while the parasol mast stays out of sight. As the big brother of our successful Laterna parasol, the Fratello (Italian for ‘brother’ ) gains respect with its endless possibilities. Its follows the sun, tilting to every side, and comes with a stylish silver grey frame. With its 300×300 cm. size, you know that all your guests will rest assured that they are in good hands. 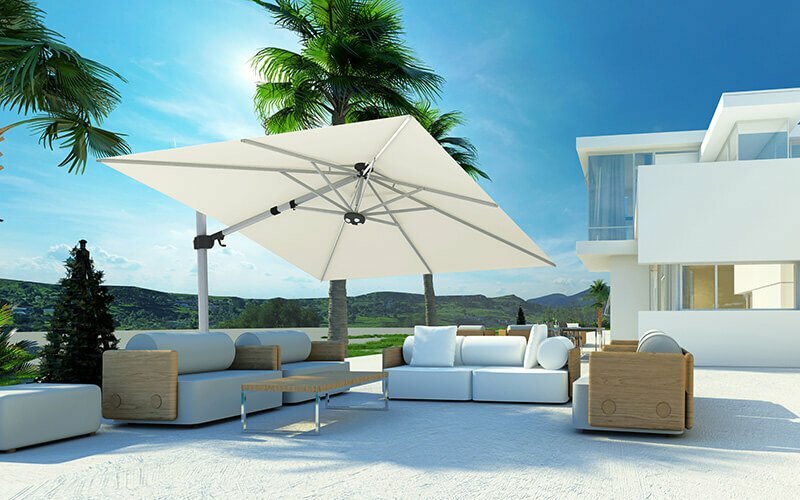 You will certainly enjoy the days and evenings under this high-quality parasol, thanks to our fade-resistant and water repellent Solero O’Bravia canopy . 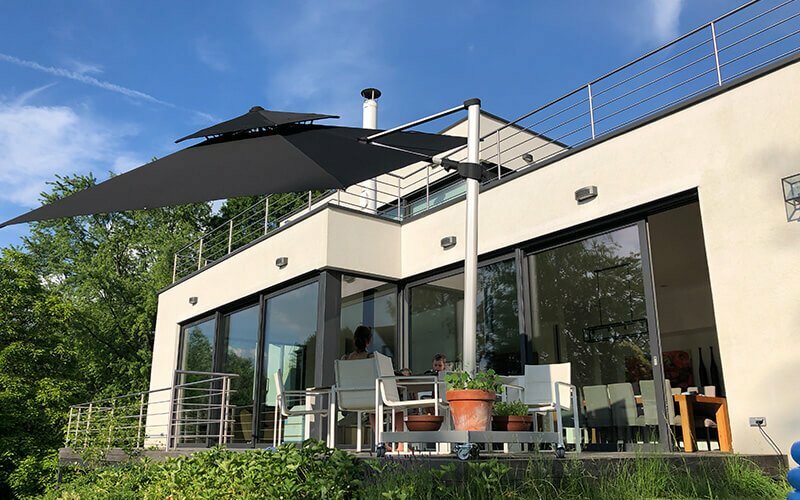 The unique design of the Fratello ensures that this large cantilever parasol works discretely for you. Enjoy the shade while the mast is hardly visible yet stylishly present. Of course the integrated winch has a smooth, luxurious action. 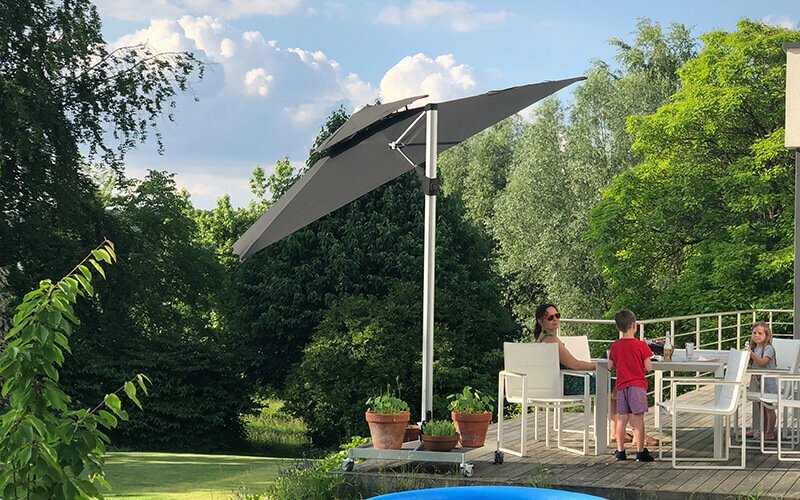 The Fratello parasol comes with a solid aluminium rotating device with foot pedal, which allows you to rotate the canopy in 360°. 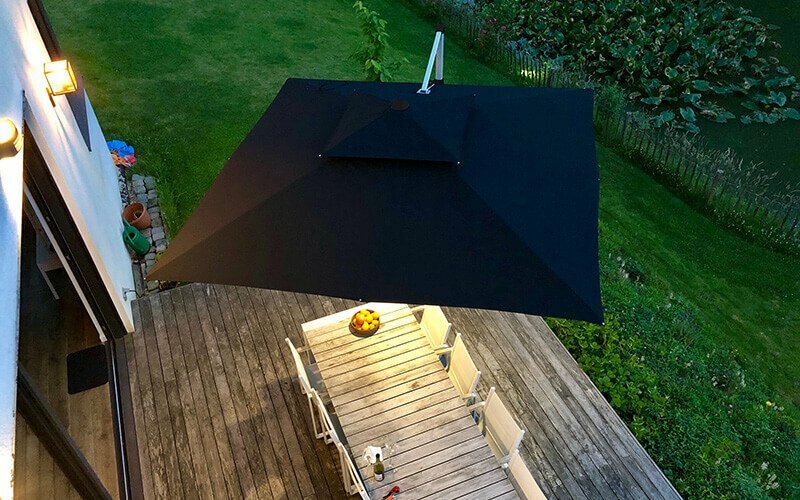 The canopy of the Fratelllo parasol can be tilted sideways. 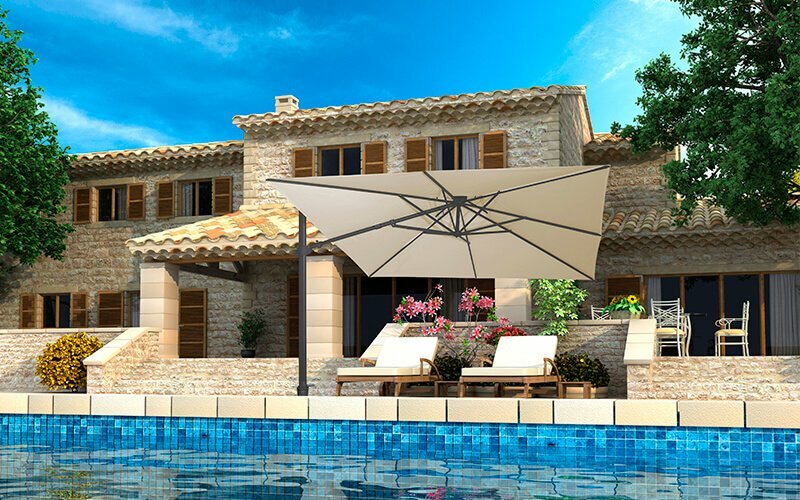 With this additional option, the Fratello parasol offers you endless possibilities to utilize your exterior to the max. The valance is the fabric strip at the bottom of the front of a sunscreen or parasol, often styled in the same pattern as the sunscreen. The word valance is historically associated with bed skirts, which could chill the undersides of beds. 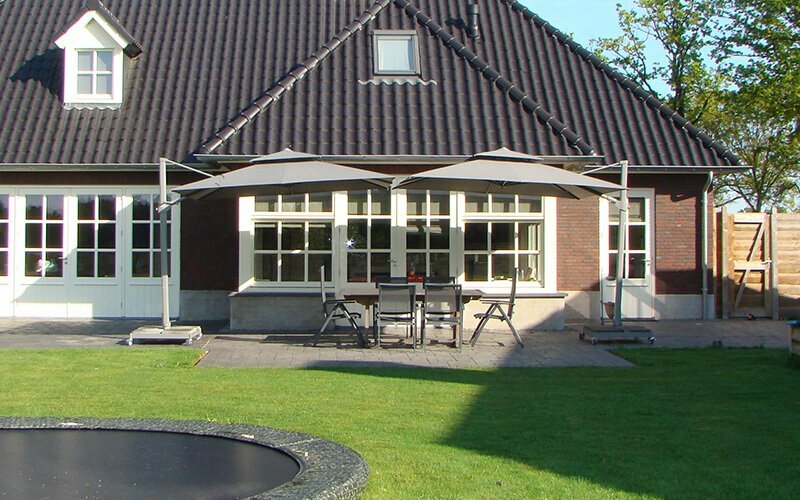 The Fratello cantilever parasol will be delivered without valance. 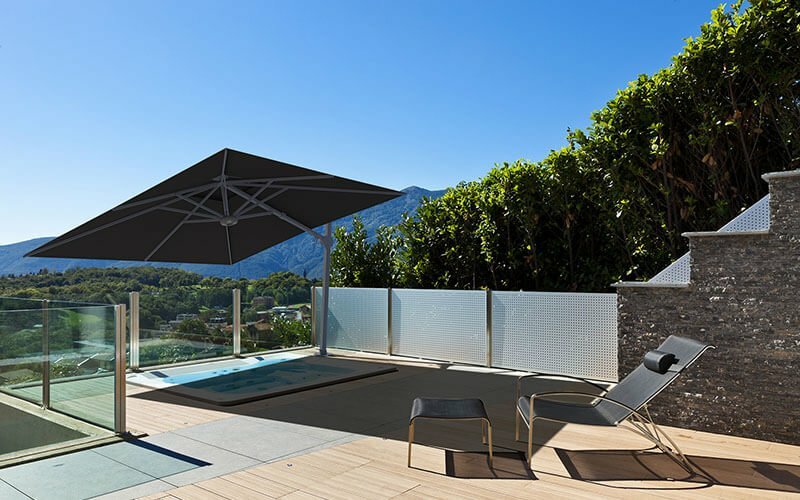 The frame of the Fratello parasol consists of two parts: the mast is locked in the aluminium tube. The parasol will take less space when it is stored. All dimensions are in our brochure, which can be found further down this page. 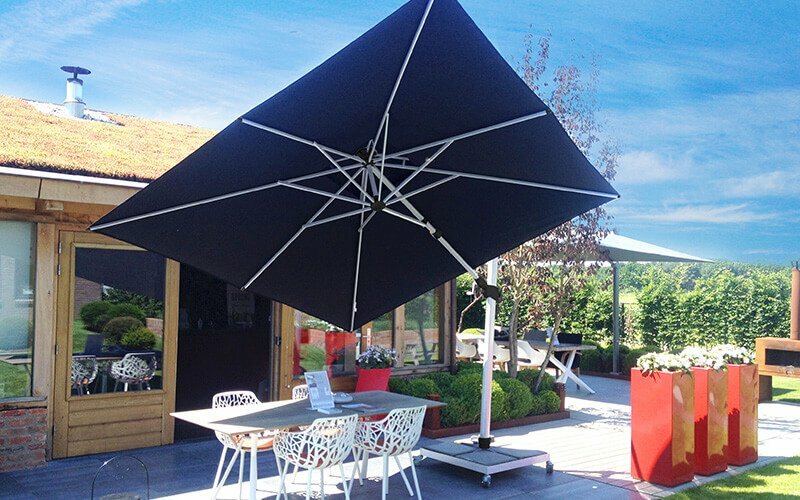 The ribs of the Solero Fratello parasols are equipped with adjustable rib ends, ensuring the cloth to be kept tight. 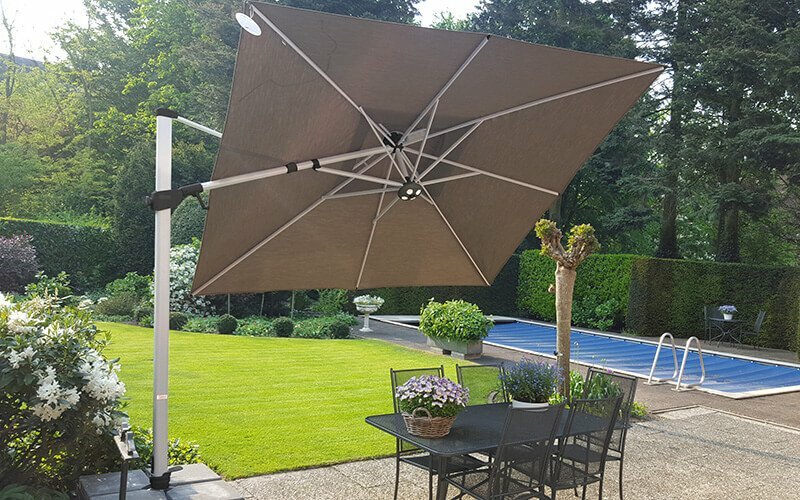 The Fratello parasol is easy to open and close by the cranking system, without having to use force. You will receive a complementary beige protective cover with your Fratello parasol. Upon your order of the Fratello parasol, you’ll receive a rechargeable and wireless lighting complimentary to your delivery. Do you want to spend some more time outside after a great dinner or to finish that book you’re reading? Our parasol lighting will make for a great addition to your set.